1. Place the dried mushrooms in a measuring jug, add 300ml/1/2pt hot stock and leave the mushrooms to soak for 15mins. 2. Melt half the butter in a large pan, add the mushrooms and cook over a high heat for 3mins until the mushrooms are golden. Transfer to a plate and set aside. 3. Add the remaining butter to the pan, add the onion and sauté for 4mins until soft. Add the garlic and rice and cook for a further 30seconds, stirring so the grains become coated in butter. Add the wine and cook, stirring until the liquid has evaporated. 4. Drain the liquid from the soaked mushrooms and add to the stock. Chop the mushrooms. Add a ladleful of the hot stock to the rice, and cook gently, stirring occasionally until the liquid has been absorbed. Continue adding the stock and cooking the rice until it becomes creamy and tender - this takes about 20-25mins. 5. 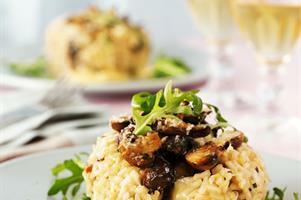 Stir in half the cooked mushrooms, the chopped dried mushrooms and half the parmesan. Season to taste. Now transfer to a shallow dish and leave to cool completely. 6. When cold, divide the mixture into 4 then use wet hands to shape each quarter into a round, place a piece of cheese in the centre of the round, then shape the rice around it so that it is buried in the centre of the cake. Place on a baking parchment lined baking sheet. Repeat to make four cakes in the same way. 7. When ready to cook, preheat the oven to 190C/Fan170C/Gas Mark 5. Divide the remaining mushrooms between the cakes, heaping them on top. Scatter over the remaining Parmesan. Bake for 20mins, until piping hot. Serve garnished with rocket. These risotto cakes could be made up to 48hrs ahead, wrapped in clear film and chilled until ready to bake.